The Persona series has been in existence for 20 years now, and what was initially just a branch off the Shin Megami Tensei series has turned into its own phenomenon, as Persona has all but replaced Final Fantasy as the premier RPG series according to many of the genre’s pundits. Originally announced for just the PlayStation 3, Persona 5 obviously marks the fifth entry in the long-running Atlus series, and it’s the first new numbered Persona title since the fourth game came out on the PlayStation 2. Considering it basically skipped what was the longest generation in gaming, expectations of the game are obviously high, and it’s safe to say that Atlus has undoubtedly outdone itself. The JRPG genre hardly has any reasons to use the word “unique” to describe anything, as a lot of the more well-known titles have developed tropes over the years that gamers in tune with the genre are all too familiar with. For what it’s worth, ever since the release of Persona 3, the series has one particular mechanic that no other series has been able to genuinely emulate, and that’s its day-to-day school system. Persona 5, like the third and fourth games before it, puts the main character in a new high school setting to provide a sense of normalcy to the story. 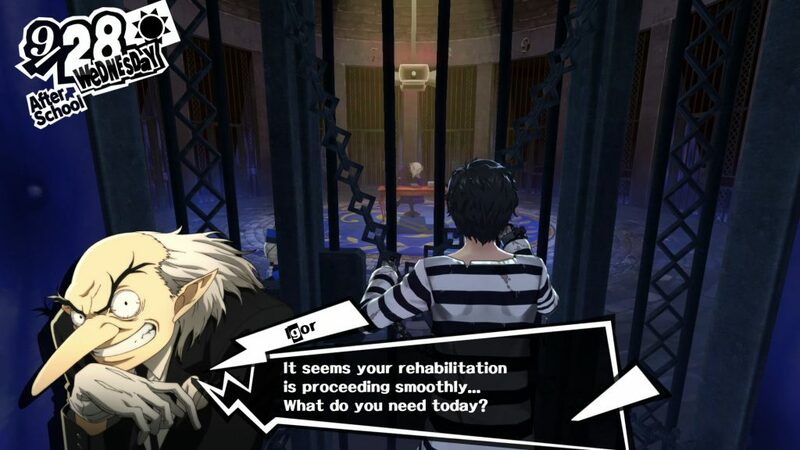 This time around, you’re transferred to Shujin Academy as a result of being put on probation on assault charges when all you really did was try to protect a woman who looked like she was going to get raped. 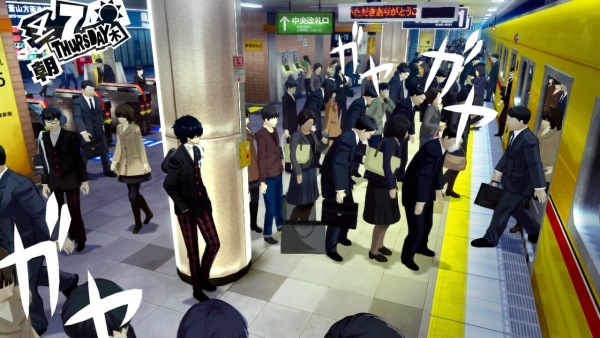 While the game is entirely fictional, Persona 5 does a hell of a job illustrating what it’s like to live in Japan, namely Shibuya. If the content comes off as a bit of a surprise, the Shin Megami Tensei and Persona series are both known for darker content, as they definitely earn their M ratings thanks to aggressive dialog and undoubtedly mature themes. Like the overlooked Tokyo Mirage Sessions #FE before it, Persona 5 puts players in the hustle and bustle of Tokyo town of Shibuya, and while the Persona series has always given players plenty to do and think about, Persona 5 is obviously no exception. There are plenty of characters both playable and unplayable to form social links with that’ll help throughout the game, and almost everything you do will have some sort of impact as your make your way through the meat of the story. After school, you’ll have the choice of hanging out with friends, working at various part time jobs (weirdly at your own accord), and taking part in other leisure activities to level up the various traits the main character has. Time shouldn’t be wasted, as players will often find themselves wanting to do more activities when they actually should be sleeping both in the game and in real life. Of course, it’s not all about going to school and having a social life. On top of apparently being a criminal transfer student, you’re also the leader of the Phantom Thieves, a ragtag group of teenagers that promotes positive social change by performing what’s called a “change of heart” on various targets of significant power and social standing. Victims of the Phantom Thieves include a gym teacher that abuses scholastic athletes physically and sexually, a renowned artist who plagiarizes his own students, and even a mafia boss in Shinjuku among others. How do the Phantom Thieves accomplish such feats? First they enter what’s called the Metaverse, an alternative universe believed to have cognitive versions of its real life counterparts. Central to the Metaverse are what are called Palaces, personal microcosms made in their targets’ imaginations that also double as the game’s dungeons. The awkward camera kind of deteriorates the stealth aspect in Palaces, but you won’t be using stealth all that much anyway. In the case of the aforementioned perverted gym teacher, he believed that Shujin Academy was his castle, and he was its king. In gaming terms, the castle ends up being the first dungeon or palace. 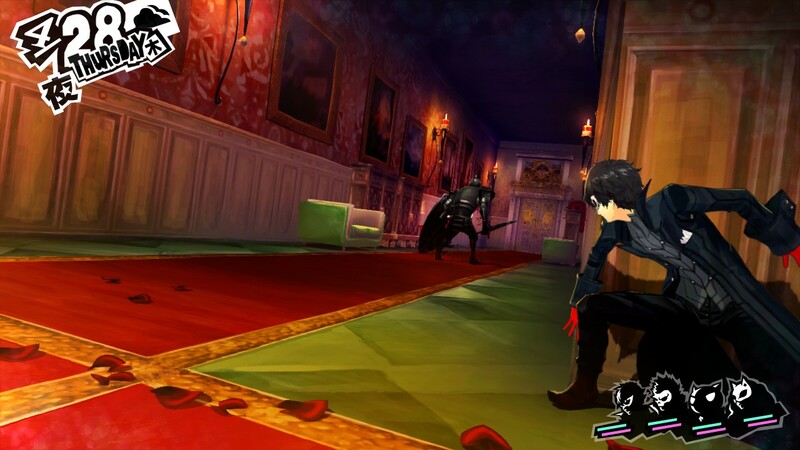 The Phantom Thieves task themselves with stealing the treasure in these palaces, and that’s what causes their targets to undergo a change of heart. When having gone through a change of heart, victims oftentimes atone for their sins by publicly announcing all the crimes they’ve committed, causing all sorts of shock in the world, namely in the areas they frequent. 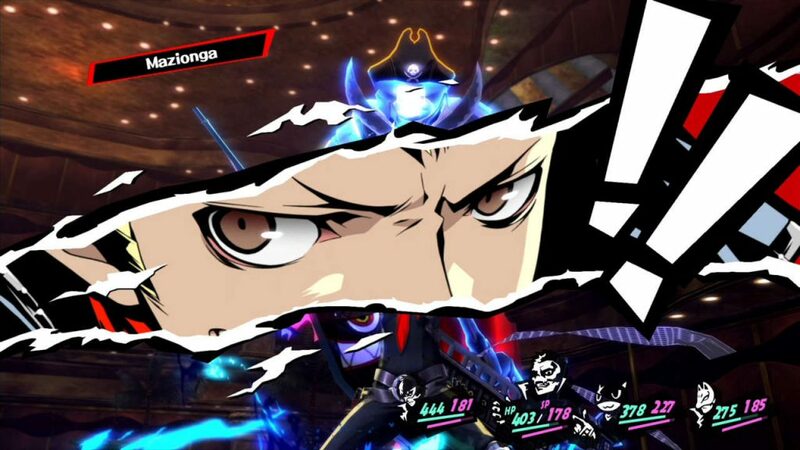 If you’re a Persona fan, does that mean the Metaverse is Persona 5‘s version of Tartartus or the Midnight Channel? Sort of. The activities in the Metaverse definitely make up all gameplay that has nothing to do with living your main character’s normal life, but the dynamic of these environments is entirely different. The biggest difference between the Metaverse Palaces and the dungeon mechanics in previous games is that they aren’t procedurally generated. This change seemingly opened things up considerably for the development team as these locations look a whole lot less generic than the dungeons seen in previous Persona games. From a castle to a modern casino to even outer space, Persona 5 does a fantastic job mixing things up and making sure things don’t get dull. What’s even more amazing is the fact that Persona continues to not follow typical video game tropes. While it’s true that you end up in a castle, there are no caves to explore, you don’t end up in a volcano, and you never deal with an winter wonderland, so it all feels refreshingly different. Fans of the Tartarus and the Midnight Channel shouldn’t feel left out though, as the game includes a dungeon that players continuously come back to called Mementos, which is explained as a cognitive world for everybody else in the general public whose dark fantasies aren’t nearly as deep as those with a Palace. Exploring Mementos acts as an opportune time to work on different sidequests to change the hearts of less famous people, while also being an ideal chance to grind in the game. The main drawback to them is just like the palaces, exploring Mementos takes up a day that you can be using to do whatever else you want to do, and even when you get home in the evening — the main character will be obligated to go to sleep. Fully adhering to the Persona formula is its turn-based battle system. In an era where established RPG franchises are taking a more action-based approach, Persona 5‘s battle system has remained exactly the same all while adding useful features from previous Shin Megami Tensei games to give it a fresh feel. Making a welcome return is the “one more” feature which allows a party member to have an extra attack when exploiting a weakness or landing a critical attack on an enemy, but one additional step here totally changes the game for the better. You can perform what’s called a “Hold Up” when you knock every enemy on the screen down, and from here you have the choice of performing an All-Out Attack, which allows your whole party to attack everything on sight, or–taking a page out of the Shin Megami Tensei book–you can actually talk to the enemy and have it join your party as an active Persona, ask for money, or an extra item. See, Square Enix? You don’t always have to a five-minute, animated spectacle for every strong attack. This time around, the main character has the ability to use multiple Personas, and it deepens the rock-paper-scissors game for which a lot of these combat systems are known. The fact that Persona 5 takes a page out of Shin Megami Tensei itself is surprising considering the fact that the Persona series started taking the Shin Megami Tensei name out of its titles since Persona 4: Golden. Be that as it may, it’s a more than welcome addition that makes the battle system even better. As my gaming palate has matured, I’m finding it less and less important for a game to have great graphics. Coming off of fantastic visual experiences in The Legend of Zelda: Breath of the Wild and Horizon: Zero Dawn, I didn’t expect the visuals of Persona 5 to wow me as much as they did. 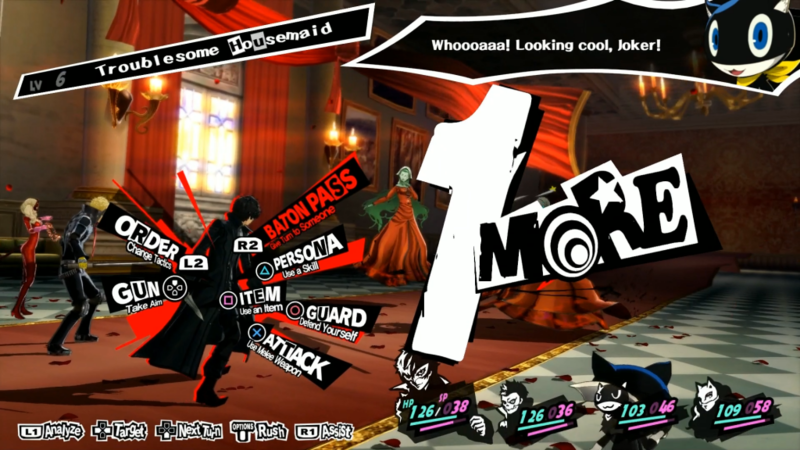 The UI and menus in Persona 5 are just so damn cool-looking. Once again directed by Shigenori Soejima, the game character design and overall look of the game is simply fantastic, but what really deserves a huge amount of credit is its UI design. Headed by Masayoshi Suto, Persona 5 probably has the best UI that I’ve ever experienced in any RPG. Everything from the speech balloons to the menus pop up in visually satisfying ways, making every screenshot of the game a good screenshot. Persona 5‘s stylistic approach in its art direction is something that really can only that can be accomplished in a Persona game, and it’s outstanding. The music, again directed by series mainstay Shoji Meguro, also hits it out of the park. The sounds and lyrics (even though I can’t distinguish a single verse) totally go with the art style and UI in a way that only this game can really do. I poured over 100 hours into my first playthrough, and I told myself many times that I’d head to bed at 2:00 am, only to find myself going to sleep at 6:00 am on a work day, and the reason I kept coming back was because the music motivated me to do so. I don’t think I’ve said that about the music of any other series, and that includes Mario and Zelda. If you even have a slight interest in RPG’s, Persona 5 is easily a recommended must-have. 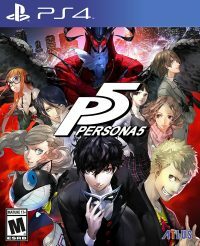 At over 100 hours, you’re definitely getting a whole lot of game, but everything from the production value to the battle system and even its painfully relevant story about the devolution of the human race make Persona 5 a staple of this gaming generation and more than justifies the series as the king of JRPG’s. A review code of the PS4 version of the game was provided by the publisher.